Mackle Petfoods are committed to producing only the finest foods for both cats and dogs, meeting and indeed exceeding their needs for a highly nutritional and palatable food. A high level of care and attention is given to the manufacture of these products throughout all stages of its process, from raw material reception to delivery to customers. The process is audited externally by the British Retail Consortium (BRC), so you can be confident that our quality systems comply with the best. 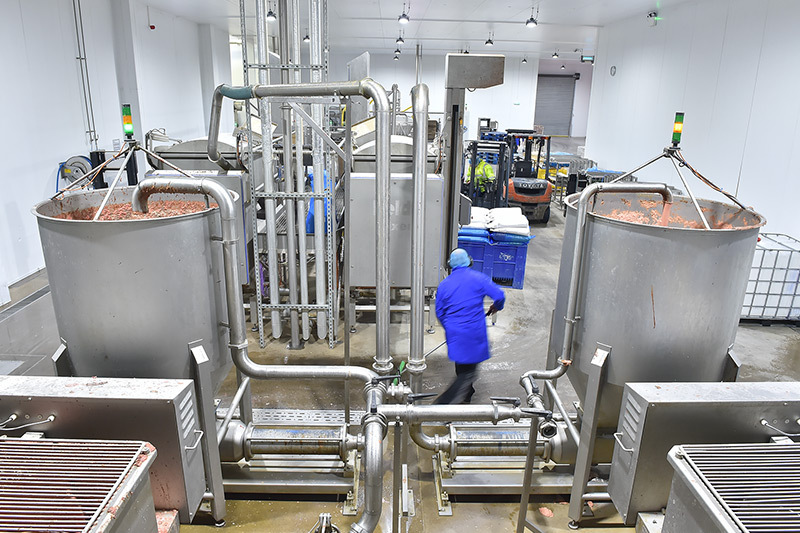 The high-grade raw materials purchased for our products are brought in fresh or freshly frozen from local approved and licensed abattoirs, boning halls and fisheries ensuring that the nutritional content of the product is at its optimum at the time of processing within a short time from intake reception. Sensory analysis and temperature testing of raw ingredients to verify compliance with the required specifications before the delivery is approved and can be unloaded and booked on to the computerised system for traceability. Elimination of metal as all raw ingredients are passed through a metal detector before production of that batch begins. The detectors are challenged and verified hourly with test samples of metallic particles to ensure compliance. Pre-kitting of all the ingredients prior production with all the batch numbers and quantities of the ingredients recorded and verified for traceability. During the filling operation X-ray analysers measure the fill contents of our cans and reject any that do not meet the required level. Staff also check weigh samples using calibrated balances to verify the weights of cans, trays and bags comply with the stated quantity. Seal integrity of containers is checked throughout filling to ensure that leakage will not occur. Seam integrity checks are carried out every four hours, with frequent visual inspections throughout the day. 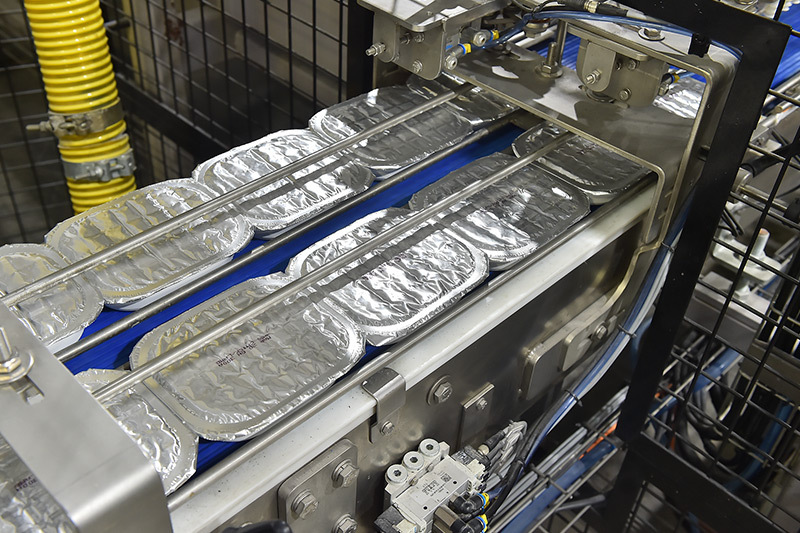 Cooking temperatures are recorded and verified by staff after the products have passed through the automated retort process. Samples from each batch are collected and incubated at 37°C and 57°C for ten days to ensure that no gas is being produced, which would indicate a less than satisfactory product. Products from the previous day’s production are selected for each batch and inspected for their organoleptic properties as well as their pH, so that the quality of the product is being constantly reviewed and maintained. All results are documented and retained for future reference. All our products are fully traceable from farm to bowl so you can rest assure that the source for all our meats is always known and available. We do our best to give your pet the best. As a member of Campden and Chorleywood Food Research Association, the company is kept up to date with technological advances in the canning industry. The technologies used in the manufacture of the products are constantly reviewed and kept current, with new developments in manufacturing, and process control being investigated and where needed implemented, to help reduce energy, waste and our carbon footprint. We comply with all customer and legislative requirements and the guidelines set out by the PFMA.